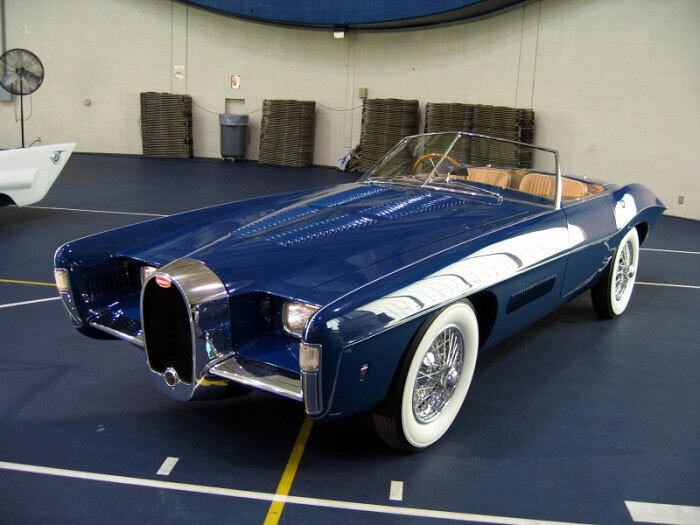 The 1966 Exner Bugatti Roadster by Ghia was the result of three separate auto legends working together. Virgil Exner made his fame designing stunning show cars and the finned "Forward Look" Chrysler vehicles of the Fifties. Bugatti became legendary for its sports/racing cars of the Thirties. Ghia is the highly respected coachbuilder that over the years has produced many one-off show cars. Put the three together and you have what we call the 1966 Exner Bugatti by Ghia, though this car's title actually reads Bugatti 101C. In November 1965, Motor Trend wrote about the 1966 Exner Bugatti Roadster by Ghia that "This modern classic 2-passenger roadster is the latest thing off Virgil Exner's drawing board. It's his version of the modern Bugatti. Chassis is actually a Bugatti, shortened to 112 inches (from 130). Power comes from the last dohc, Type 57, Straight 8 Bugatti built in 1951 by Pierri Marko, Etorre [Bugatti's] right-hand man, who made one final attempt to revive the car. Only 6 chassis/engine combinations were built and only 5 bodies fitted." Etorre Bugatti's death in 1947 presaged the collapse of the automotive dynasty that bore his name. The decline had begun when Bugatti's talented son Jean fatally crashed while testing a powerful Grand Prix racer in 1939. That blow was followed by World War II. Fortunately, a cache of parts remaining from the legendary prewar Type 57 enabled loyal works personnel to assemble a new model without extensive retooling. The Type 101, unveiled in 1951, was a modernized version of the Type 57. Its chassis carried the same straight-eight engine, but the twin overhead cams were now driven by chains instead of gears. The supercharged 3,257-cc Type 101C engine developed 200 horsepower. A silent four-speed gearbox with overdrive and Lockheed hydraulic brakes were new, but the solid front axle was a carryover. Of the five chassis of the new "Bug" that received coachwork, two were shown at the 1951 Paris Salon. The sixth -- set aside as a show chassis -- was purchased by Exner in the early Sixties for $2,500. He designed the modern-but-classic exterior, highlighted by a traditional Bugatti-style grille. Virgil Exner Jr. did the interior. Ghia, meanwhile, spent six months building the steel-bodied one-off.